Pay N Play Casinos: The revolutionary way to gamble online without registering an account. If you’ve been computing long enough, you’ll remember the days when every piece of hardware you wanted to use with your system required an disk and an installation process. It was like today’s affirmation, “There’s an app for that”, but far more annoying. New keyboard? There’s a disk for that. New mouse? There’s a disk for that. New Printer? You guessed it – there’s a disk for that, too! Then came the era of “Plug N Play”, and it changed everything! Now we simply plug a USB cable into our computer or laptop, and within seconds, the device on the other end of that cable works. We even have USB dongles that instantly connect and operate bluetooth devices. Those of you who remember those days will truly appreciate a new program known as Pay N Play. It’s a digital payment platform that is revolutionizing the online casino industry. You may want to hold on to your seats when I tell you this next part… with Pay n Play, you’ll never have to register an online casino account again! Wait, What?! Can They Do That? Yes, online casinos can accept players, processing their deposits and withdraws, without a player having to register an account, and without breaking any strict regulatory laws. Shocking, right? According to regulatory guidelines, including those in the strictest of European countries, a player’s identity must be verified, and the player must meet the qualifications to gambling online. How Pay N Play works, all those requirements are met. How Does Pay N Play Work? This system works similar to Canada’s Interac payment system, but is even more inclusive. When a player visits any online casino with Pay N Play, they can immediately choose to make a deposit. A window pops up asking how much, and in what currency. Enter that info, then choose your country of residence, followed by your banking institution. Finally, you’re directed to log into your online banking account, where you’re asked to confirm the purchase. By confirming the deposit, you’re performing two tasks at once. First, you’re approving the transaction. Second, you’re giving the online casino your personal information. The bank automatically sends the money along with your full name, physical address and date of birth. This is the exact same information you would provide during registration. Since the info is being provided by your bank, it also contributes to the identity verification process. As a cherry on top, the withdraw process becomes just as easy. You simply input the amount to withdraw and press a button. The funds are sent right back to the bank account you made the original deposit from. Like Interac, there’s no need to create a Pay N Play account to use the service. It automatically works with all banking institutions that associate with the program. So long as you have a bank account with one of those institutions, you’re eligible to use Pay N Play. Are Pay N Play Casinos Secure? I understand the trepidation. I’ve been playing at online casinos for well over a decade. When I first heard about this no-registration concept, I thought it had to be a total scheme! I figured it was part of some black-hat tactics; a new way to accept players in illegal markets without the players or operators getting caught. And we all know how many rogue sites emerge from the woodwork whenever that happens! So yes, I was extremely skeptical, until I found out exactly who is behind the program. 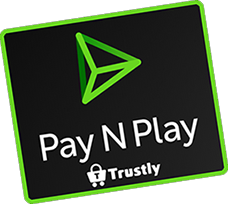 Pay N Play is a payment platform by Trustly, a Swedish fintech company that’s been facilitating electronic payments online since 2008. Trustly facilitates its ePayments through major companies like PayPal and TransferWire. Operating much like a Swedish bank, Trustly holds the same ‘Payment Institute’ license from the Swedish Financial Supervisory Authority. Thus there’s no question as to the security behind the platform. The only problem with this auto-registration payment method is that it’s not widely available. At least, not yet. As of 2016, Trustly has been working with over 100 banking institutions across 29 European countries. Online casinos that offer the services are presently serving players in Finland, France, Germany and Sweden only. According to sources, however, that’s going to change soon enough. Rumor has it Trustly is working to impart its Pay N Play services across major Canadian banks. Assuming that information is accurate, and that the proper licenses are obtainable, it shouldn’t be long before we have access to Pay N Play casinos in Canada.